“Childish Gambino,” the moniker that all-around entertainer Donald Glover goes by as a recording artist, shall soon be no more. The rapper-singer-actor-producer-generally multitalented jack-of-all-trades announced over the weekend at the Governor’s Ball Music Festival in New York City that his next album will be his last. “I’ll see you for the last Gambino album,” Glover quipped at the end of his performance. Later, at an event to promote his FX show Atlanta, Glover confirmed to HuffPost that he’s waving goodbye to his music career, since it is not “necessary” anymore. He also talked about how he felt that “Childish Gambino” was losing some of its punkness, which is something he was not willing to sacrifice. “Redbone” is, of course, the artist’s highest-charting single to date, peaking at No. 17 on the Billboard Hot 100 this week. 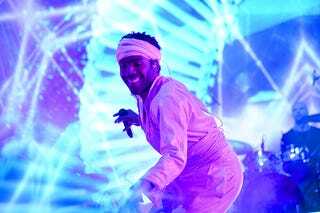 Since his debut as a recording artist in 2008, he has released some seven mixtapes, two EPS and three studio albums—a solid repertoire that seems to be enough for the performer currently—at least as Gambino.